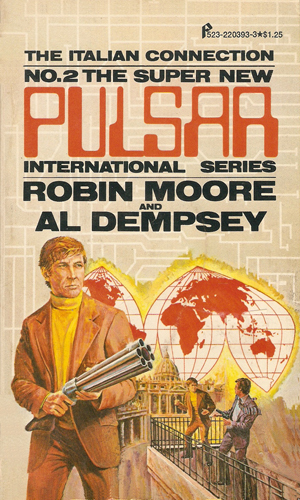 Tim Kyle is the lead agent for Pulsar International. Pulsar is a large security organization able to handle whatever mission its clients had. Working normally for world governments or huge conglomerates, the jobs done by Pulsar might involve couriering secret papers, training would-be agents, ferreting out moles, or setting up nationwide security networks. As such, this company's intelligence work covered both defensive and offensive aspects. Chief among their clientele was the CIA from whom many of Pulsar's operatives came. Kyle is the Chief Field Officer of Pulsar and a founding member of the organization since it began in Atlanta twenty years earlier. His loyalty to his boss and to the company he had given so much of his time to was unquestionable. His seniority in the company would easily qualify him for a huge corner office but his skill in the field, and his enjoyment of it, was such that it would have been a waste. Now 42, Kyle is quite a lot different than most of the male agents detailed in this compendium. First, he is very happily married with three children so strike the normal woman-chasing spy stereotype. Second, he is blessed with, and uses often, a 'computer-like' brain. The books make a lot of this computer brain idea. Often he would use its swift speed to rapidly reason out a situation. Other times he would allow a compartment to consider a matter while he tended to other things. And occasionally he would shut out the rest of the world so he might concentrate on one item alone. 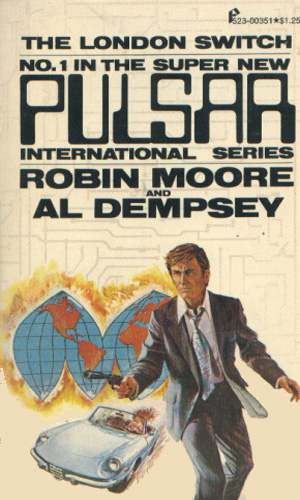 The font style of the cover is definitely 70's computer-ish further pushing that this was a state-of-the-art kind of agent. Heading to London to meet with a representative from Pulsar's largest competitor, Kyle is stunned to find himself the target of two different highly skilled assassins, both anxious to see him dead no matter the cost. Searching for a missing friend, Kyle becomes embroiled in a plot to disrupt the international money market, bring chaos to the global economy. The case takes him from Canada to the Caribbean and on to Italy where someone in the Vatican plays a key role. Both of the books in this series read like made-to-TV action movies, fast-paced with lots of car chases, explosions, and gun play. They are enjoyable but not memorable. I wouldn't have minded more books about Kyle because I felt they were just starting to make him interesting but, alas, two is all there is. It is only a personal feeling but I can't shake the idea that this series was somewhat influenced by the television spy series Search which made its debut two years earlier. Certainly this is not a rip-off as it has considerable differences but the idea persists.